Every once and awhile when a radio comes off the bench at Joe's Radio Shop, we ask ourselves "do we really want to sell this one?" Here we have the finest Zenith "Chrome Front" we have ever restored. 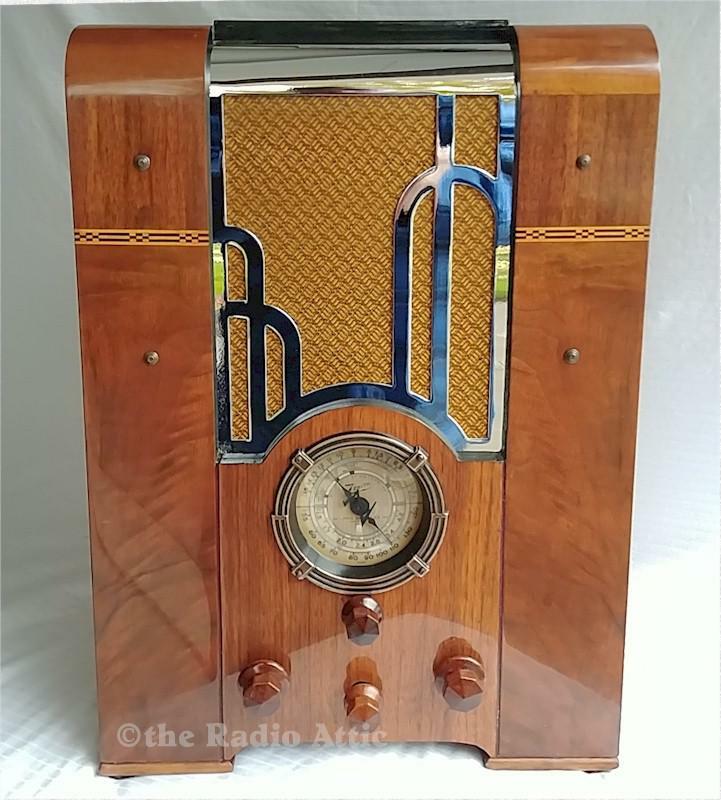 We are offering it today for the serious collector of beautiful and rare radios. There are never any shortcuts taken at Joe's and this beauty is no exception. This five-tube, three-band (SB, SW, Police) radio plays like new with good tone and volume. The wax/paper capacitors have been replaced by new epoxy coated caps of equal values. The tubes and resistors have been checked and replaced as needed. A safety fuse was added and an audio cable installed to play your own device. Gary refinished the cabinet with the finest grain filler, toner and lacquer and polished the cabinet to a "factory fresh" luster. He commented that it is very unusual that there were no repairs to this 83 year old cabinet. The five-tube chassis, speaker and knobs are original to the set. The chrome has been re-plated and the grille cloth is an accurate reproduction of the original. You'll never regret buying the best. 16-1/2"H x 12"W x 7-1/2"D.
You are visitor number 726 to this page.